Crew (pictured): Front row, L to R, Don Brazee, Pilot; Randrup, Co-Pilot; Burt Lewis, Navigator; Emory Cook, Bombardier. Back row, L to R, Sgt. Farrell, Engineer; Willoughby, Radio Operator; Lovelace, Ball Turret; Wall, Waist Gunner; Kelly, Tail Gunner. The above photo is of the original crew that ferried over to North Africa, Via South America and Southern Africa and Arrived in North Africa, December 31, 1942, after the conclusion of Operation Torch, the invasion of North Africa. The 12h Air Force was created using the 97th and 301st Bomb Groups from the 8th Air Force Stationed in England. Elements of these groups went to N.Africa and were joined and reinforced by new crews and squadrons arriving from the States. 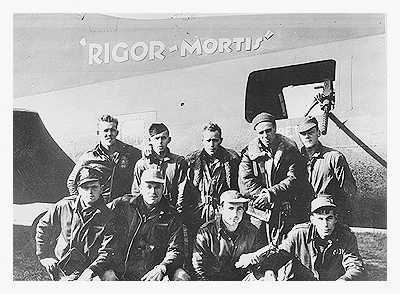 The Rigor Mortis crew flew their first mission on January 2, 1943, 2 days after arriving into the combat zone. 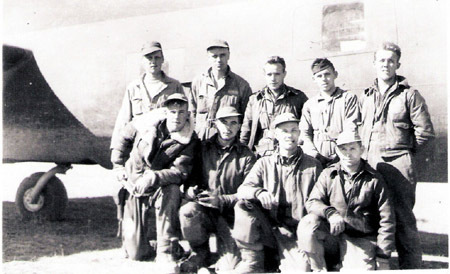 The photo below is of the crew either before or after a mission on: 1/14/43, 1/23/43, 1/29/43. Front Row: L. to R.
Back Row L. to R.
Assigned 31 Dec 42 to 301st BG. Flew 95 missions with 301st BG. Transfer to 2nd BG 14 Nov 43. Flew 18 missions with 2nd BG. Transfer to 99th BG 28 Mar 44. Flew no missions with 99th BG.